​There are many different types of locks and several different security factors to consider before purchasing. The four most common are padlocks, deadbolts, knob locks, and levers. This page will explain the different types of locks and their features. ​Padlocks are the only type of lock that is typically not permanently attached to anything else. They come in a range of sizes, are free standing and portable, and are one of the most easily recognizable types of lock. Padlocks come in two main varieties: combination and keyed. Combination locks have one or more number dials that open the lock when the correct combination is entered. Keyed padlocks can be re-keyable or non re-keyable. Digital locks provide a low cost, easy to install security solution for homes and buildings that require a reliable means of access control but where the allocation of keys or cards is unpractical due to the volume of people entering and exiting the building. Digital door locks are quick and easy to fit as they are completely self-contained, require no additional hardware, ideally suited for small budget systems. They are typically used in public buildings such as hospitals, offices and schools, or for domestic properties where numerous members or professionals need independent access. Knob locks are most commonly found in residential homes as the primary locking device on both internal and external doors. These locks have a key cylinder located on one side and a rotatable knob on the other that controls the locking mechanism. When utilizing these locks on external doors they should always be accompanied by a secondary lock – such as a deadbolt – as they are very easily compromised to brute force attacks. All it takes is a hammer to knock off the knob and pliers to disengage the locking mechanism for someone to bypass these locks. They are also very prone to lock picking and shimming. Lever handle locks are frequently used for inner doors in commercial settings. They are easier to open than knob locks as they have a large push down style handle rather than a knob that one must grasp and turn. Frequently when handicap accessibility is important lever locks are used. The cam lock is made up of a cylindrical base that has a keyhole and a metal piece known as the cam that sits perpendicularly to the end of the base. When the key is inserted into the keyhole and turns, it turns the cam up or down. In the locked position, the cam is horizontal and fitted into a strike plate that’s attached to the frame of the door. But when the key turns the cam up or down, it frees itself from the strike plate allowing the door to open. These locks come with multiple types of cams with the most common being straight and hooked. Straight cams are simply a metal bar that fits into a strike plate. Hooked cams have a small hook in the end that latches onto an item not attached to the lock. Mortise locks are used on many types of residential doors, including storm doors and stress convenience over security. The lockset consists of a flat, rectangular box that fits into a recess in the door from its edge and includes two faceplates with knobs and keyholes. The latch operates from either side except when the outside knob is locked, and the deadbolt operates by a turn of the inside knob. ​Euro profile is a type of cylinder design predominately used in Europe. Unlike traditional mortise and rim cylinders, the Euro profile uses a single piece of metal to connect both sides of the lock. A single cam component is placed between the two sides of the lock and is directly connected to both plugs. The Euro profile is convenient to install and replace and has several unique characteristics when compared with other cylinder designs. In particular, many designs only allow one side to engage the cam at any given time. This allows the owner of a double sided Euro profile lock to insert a key on the inner side to engage the cam and prevent it from being opened with a key on the outer side. Jimmy Proof deadbolts are commonly found in older apartments and double doors. These locks are surface mounted on the inside of the door and are very easy to install. The idea behind the creation of these locks was to prevent burglars from meddling with the deadbolt locking mechanism and gaining entry by simply prying apart the door frame with a crowbar. These types of locks use two interlocking vertical bolts that fall into a strike plate when the lock is engaged. 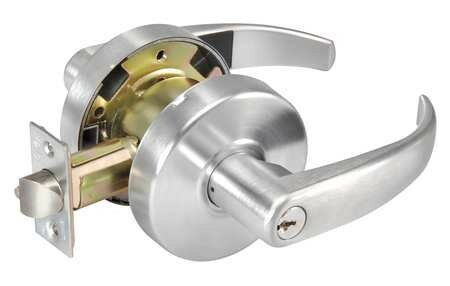 Jimmy Proof deadbolts usually utilize a single cylinder that uses a key on one side and a turnable knob on the other. Additionally, these deadbolts sometimes have a unique toggle that allows you to lock the deadbolt so that even a key can not disengage the lock from the outside. This secondary lock makes these locks impervious lockpicking. Rim Locks and Latches have been used for centuries to lock and latch doors. They sit on the surface of the door rather than set into the edge of the door, traditionally because the door would not have been thick enough to take a mortise lock or latch. They therefore have a strong visual presence and will add instant character to any setting. A rim lock or latch requires a special type of door knob (a "rim" knob). A Key in Knob cylinder is generally found at the heart of most knobs, levers, and lower cost deadbolts and common to modern commercial leversets and residential knob locks. While the 'core' may be the same diameter as other lock profile, the rest of the lock is quite small and thin. If KIK locks are not installed into handles or knob and surrounded by metal, they are very vulnerable to being broken off. There are still additional types of locks like European locks, switch locks, deposit box locks, furniture locks, wall mounted locks, Vending/ T-Handle Locks. If you have questions about other types of locks, please contact us.